Officials from the City of Presque Isle are looking for ways to restore the water quality of the Kennedy Brook watershed, which has failed to meet state environmental standards for many years now. PRESQUE ISLE, Maine — Officials from the City of Presque Isle are looking for ways to restore the water quality of the Kennedy Brook watershed, which has failed to meet state environmental standards for many years now. 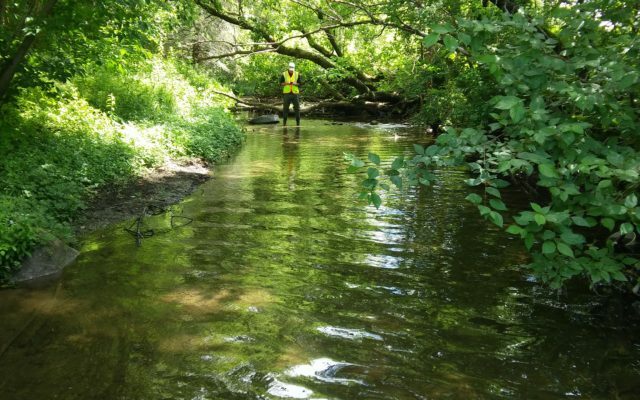 City officials recently completed a study that allowed them to test the water quality of the one-mile long stream that flows from the east side of Route 10, through Mantle Lake Park and ends at Presque Isle Stream. Currently, Kennedy Brook does not meet the Maine Department of Environmental Protection’s Class B standards for water quality, which requires water to be safe for swimming and for drinking after proper treatment. Ken Arndt, Presque Isle director of planning and development, said the city has noticed a decline in Kennedy Brook’s water quality since the mid-2000s. 2012 marked the first year in which the water quality failed to meet Class B standards due to an increasing amount of algae blooms that make the habitat dangerous for aquatic insects. “There have been many factors that we think contributed to the stream’s decline such as new snow removal chemicals like chlorine and salt, and agricultural chemicals, which lead to more run-off in the water,” Arndt said. In 2016, Presque Isle received a $42,000 grant from the Maine DEP for the study of Kennedy Brook that cost a total of $52,000, with the remaining expenses covered by the city. Since then local officials have worked with Portland, Maine-based FB Environmental Associates to draft an initial watershed management plan that has a timeline of 10-years and a goal of restoring the water quality to Class B standards. The overall goal of the plan is to provide management recommendations to help the city and residents make land use decisions around the watershed area to protect and improve the health of Kennedy Brook. Among the actions that the plan identifies to achieve the goal are: monitor and reduce sediment and nutrients entering the stream; prioritize culvert repair, replacement and realignment projects; establish stream bank buffers in at least three areas; develop an ordinance regulating development in the area; install stormwater retrofits; and establish agricultural best management practices in the watershed to control nonpoint source pollution entering Kennedy Brook. The next steps, Arndt said, also involve an educational outreach campaign in which he and city officials will give presentations to local civic organizations and classrooms. They hope to create greater public awareness of the future roles community members can play in monitoring the Kennedy Brook watershed for water quality. Over the next year, city officials will further develop a specific community project that they can implement as part of the long-term restoration efforts of Kennedy Brook. Arndt said the project could potentially be eligible for competitive funds from the U.S. Department of Agriculture or the U.S. Environmental Protection Agency, which they will likely apply for during the summer of 2019. If the city is successful in obtaining grant funding, it will begin to implement the project in January 2020. Arndt hopes that any expenses that grant funding does not cover would be covered by contributions from civic organizations and city funds. The management plan states that the full estimated cost for the project implementation will between about $31,000 and $57,000 per year over the next 10 years. Through the project the city would likely increase the number of continuous monitoring machines, provided by the Maine DEP, that were used to monitor Kennedy Brook’s dissolved oxygen levels and temperature during the environmental study. “The monitors would have to be checked once a month to make sure they’re functioning properly,” Arndt said. He also noted that restoring Kennedy Brook will ultimately lead to better recreational opportunities, such as fishing, for community members who visit Mantle Lake Park and surrounding areas of the watershed.